​Family maximum monthly tuition is $85 for all classes (not including registration and building fees). See fee information at the bottom of this page. Monthly tuition is due at the first class of each month. Please see our Payment Policies for more detailed information. For each new family you refer, you will receive $25 off your student's tuition. Beginner music class with choral focus. It is preferred that a parent stay on campus during their K-2nd grade student's class. Skills taught are pitch matching, solfege with Curwen hand signs, basic music reading, folk songs, sacred songs, singing in a round, partner songs, comparatives (high/low, same/different, fast/slow, soft/loud), beat, rhythm, vowel formation, dynamics, phrases, most notes and rests. There will be two in-class parent demonstration days per semester. More advanced music class and choir. Skills taught will build on what students learned in lower elementary class and will also be taught phrases, pitch matching, absolute pitch names, solfege skills, putting solfege on the staff, music reading, rhythm reading, note names, two-part singing, all notes and rests, beginning breathing techniques, vowel formation, dynamics, and diction. There will be two formal concerts per semester. Advanced music class and choir for middle school and high school aged students. Men and ladies are taught separately in class and them come together for rehearsals and concerts to sing as a full choir. Skills taught will build on what students have learned in past classes and will also include some two but mainly three-part singing, singing with dynamics, phrasing, articulation, solfege skills, breathing, diction, singing in a variety of languages, sight reading, and small ensemble singing. This is our only auditioned choir group and most advanced class for 9th-12th grade students. 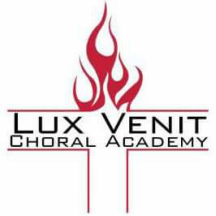 Middle school and high school aged students who are new to Lux Venit will take this class for half a semester to prepare them and give them more confidence for joining their choir. This is separate from the family cap. $15 extra a month for Upper Elem. ​Registration Fee (per child, per semester): A non-refundable registration fee per child will be required to hold your student's spot at the beginning of each semester. This fee will cover supplies, including music, rewards, teaching aids, paper and printing costs, etc., but does NOT include uniforms.